Jacksonville, FL. 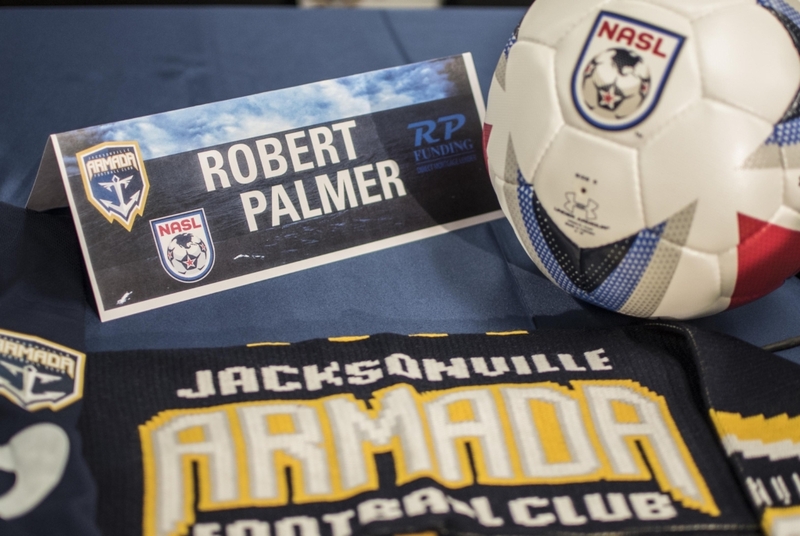 July 28, 2017 - At his first press conference as the Armada's new owner, RP Funding President and CEO Robert Palmer radiated the kind of energy only someone who just purchased a growing sports franchise can. "This is an amazing moment for me," said Palmer after being introduced by NASL President Rishi Sehgal. "Sports ownership has been something I've been interested in since I was a little kid. Who isn't at some point in their life? We all dream of owning a sports team. Now, here I sit." Despite a solid third-place finish in NASL's spring season and a passionate Jacksonville fan base, the last few years have been marked by turmoil in the Armada organization. After joining the NASL in 2015, the Armada has experienced significant financial losses, partially stemming from expenses related to the conversion of the Baseball Grounds of Jacksonville into a suitable playing field. Today, head coach Mark Lowry fields the smallest squad in the eight-team league, and the club now plays their home matches at the University of North Florida's Hodges Stadium. Already, Palmer seems to be bringing a degree of stability to the front office - something that's been missing since longtime owner Mark Frisch sold the franchise back to the NASL in January 2017. "Moments before coming in here," revealed Palmer not two minutes into his introduction, "we put both [Technical Director] Nathan Walter and Coach Lowry on long-term contracts through the 2021 season." The announcement was met with raucous applause. Sehgal describes Palmer as a man with "deep ties to the Jacksonville community." In addition to owning a home in Neptune Beach, RP Funding now employs over 80 Jacksonville residents - a number, says Palmer, expected to double in the next year. But as well-recognized as the RP Funding brand is in Central Florida, it is only a small part of the Robert Palmer Companies umbrella. Palmer owns several businesses in the real estate industry. Listing Power Tools, based in Lake Mary, designs and prints single-property marketing materials for agents nationwide. His latest venture, HomeValue.com, provides consumers with a way to receive accurate home valuations not possible through standard real estate portals. Other companies owned by Palmer include RP Title and Escrow, Security National Title and Escrow, and appraisal management company ARMR. At the press conference, Palmer wasted no time demonstrating what his marketing acumen can bring to professional soccer. "You can build the best mousetrap out there, but if no one knows about it, no one is going to see it," he said. "We're really focusing on building an at-home fan base. When I study sports teams I'm a fan of from a business standpoint, I've discovered that only 20 percent of their revenue comes at the actual gate. The Armada has not done a good job monetizing outside the gate in the past. That's the first thing we're going to clean up." To illustrate his strategy, the new owner also announced an expanded television slate. For the 2017 season, all Armada games, home and away, will be broadcasted on CW-17. A few other games, including the season opener on July 30th, will be upgraded to JXT Channel 4. 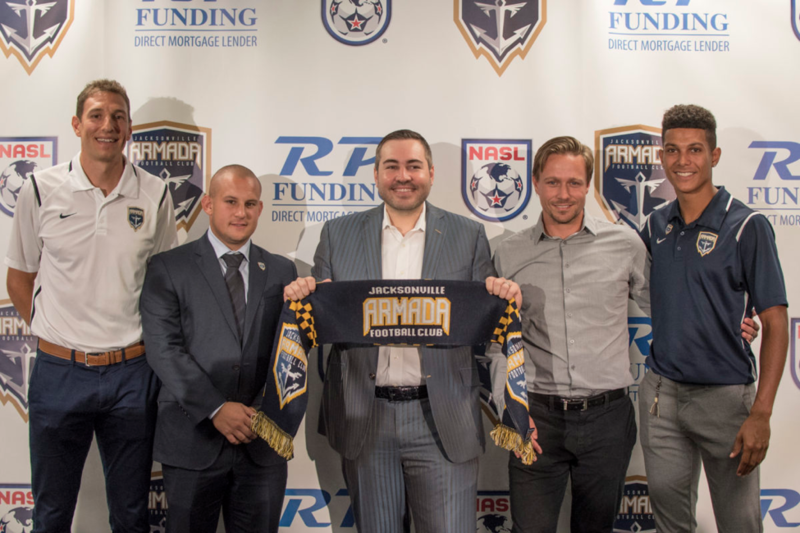 For the Armada, it's safe to say the ship has been righted, and the Jacksonville community finally has a reason to be excited for soccer once again.